Breath-taking views, effortless style and one of the largest terraces on the north side of the Thames, this is the penthouse at Tower View. The sun sets over London’s most iconic landmarks. The Shard rises high above the south bank. A stone’s throw away, Tower Bridge dominates the river. It’s the definition of luxury living – and is as spectacular on the inside as it is looking out. To discover Tower View, call James on +44 (0)20 7483 6161 Alternatively, for more details email info@hadleypropertygroup.com. With the sixth and seventh floors entirely to yourself, this stunning 3-bed penthouse is sanctuary in the heart of the city. Intimate ambiance, matched only by impressive scale, creates a unique of belonging. No detail has been overlooked. And with contemporary design finished to the highest specifications, there’s no other place you’ll want to be at the end of those busy days. Intimate in ambience yet impressive in scale, the dining areas promise superb, elegant entertaining. The sleek contemporary lines highlight rich natural materials, displaying vibrant, contemporary design. Elegant marble, mosaic or stone tiles, custom made features and special lighting give the bathrooms the most stylish and luxurious feeling. 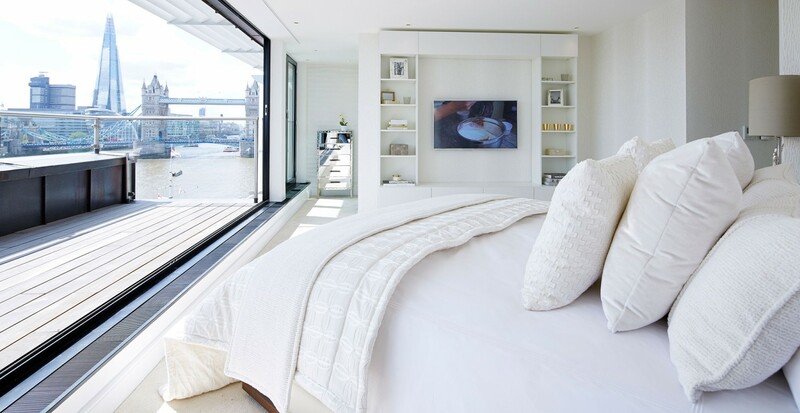 Bedrooms are designed as the ideal retreat with expansive windows allowing for maximum light and views. The three-bedroom penthouse is located on the fifth, sixth and seventh floors and provides a level of design and specification synonymous with its breathtaking panoramic views.